If you love the Scandinavian modern look and are wanting to push your décor in that direction, here are five must-haves to get you started! Color Scheme: The signature color scheme for this look includes—white—lots of white! Include light colored wood-look tile (also try Vallenlunga Tabula or Mediterranea Dream), a couple of your favorite colors as accents and pops of black. We’ve seen a lot of pastel this year, but feel free to use darker colors as well if you enjoy them. Just remember to let the white take center stage. Minimalize! The second must-have to create your Scandinavian modern look—is to get rid of things! 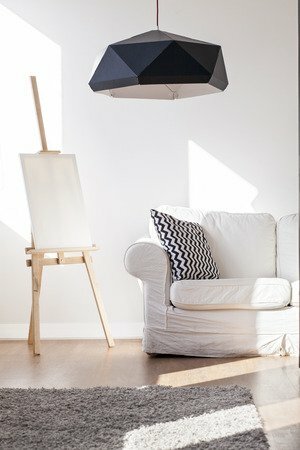 Scandinavian modern looks, as other modern looks, boast a very minimal look. Accessories and furnishings are kept to a minimum. Look through your house and start editing out extraneous items. Store some favorites away so you can swap things out as seasons change to refresh your look from time to time. Furniture: Clean lines, light toned woods and modern design are the essentials for this look. Start looking for some key pieces of furniture to begin transforming your look. Dining chairs would be a great place to start. The Danish modern chairs are essential to the overall look as many of the iconic chair designs were created by designers from Denmark. Lighting: Think simple, functional, sleek shapes. Start by finding a few accent lamps to create your new look, then add overhead lighting later as your look comes together. Accessories: Now that you’ve minimalized, it’s time to find a few key accessories that capture the Scandinavian modern look.. Often, any accessories used in Scandinavian modern homes will also have a function, as well as an interesting form. Look for tea kettles and planters that have this classic, modern look. We wish you luck in your hunt for Scandinavian modern items to transform your look into this modern, enduring style. Let us know in the comments what else you think is essential to this style. We love to hear from you!